Still obsessed with YouTube views as the key metric for knowing whether a video really connected with your audience? Not so fast, says ad agency Solve, which embarked on an experiment recently to see whether it could make literally the most uncreative video go viral. The Minneapolis agency created a four-minute video that was completely blank—no images, no sound, no title, no description. 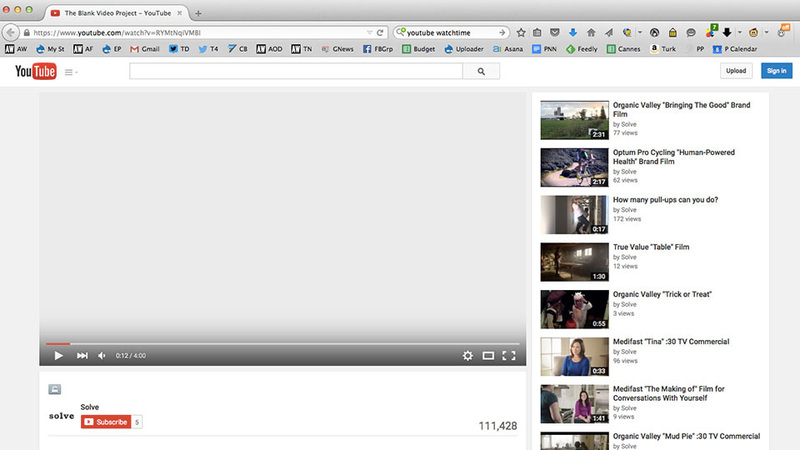 (A title, "The Blank Video Project," was added after the project ended.) The only thing it had was a click-through URL to the agency's website, solve-ideas.com. Solve promoted the video as pre-roll to U.S. viewers using YouTube TrueView In-Stream advertising. Viewers could skip it after five seconds. Solve was charged if a viewer watched at least 30 seconds. In the end, the video generated more than 100,000 views for an investment of just $1,400—or a remarkably affordable 1.4 cents per view. The ad was served 227,819 times, meaning about 46 percent of viewers watched for at least 30 seconds. Solve says viewers on average watched 61 percent (or 2:26) of the video, and 22 percent made it all the way to the end—seemingly solid engagement metrics. Nearly 1 percent even clicked through to the website. The video did not earn any likes, shares or new channel subscribers, however. The engagement data is a bit baffling. Solve speculates that many of the plays were inadvertent—that people had the video open in the background, or thought it was loading. Solve also acknowledges that the cost of 1.4 cents per view is considerably lower than average, since the video was served to the general YouTube population rather than a specific audience, which costs more to target. Still, the experiment does show how cheaply you can buy 100,000 views with even the mostly flatly uninteresting content. "Among many marketers and agency peers, 'views' have become the holy grail," Solve CEO John Colasanti tells Adweek. "Views offer a seemingly simple and easy way to measure the power of content. This is a false indicator of success, particularly when a video receives a high number of views, but a low level of likes. Often the video didn't truly go viral; the view metric was purchased." Better metrics to track, says Colasanti, are likes and shares, particularly on a per-view basis. "Tracking clickable calls-to-action, measuring deeper online behavior and conversion are also critical to monitor," he adds. Still, Solve's point is simple: Stop fetishizing views. "Creative effectiveness has always been difficult to truly measure," says Colasanti. "Many marketers are looking at views as a quick, easy indicator of content power. On its own, it simply doesn't work as an absolute and critical metric for measuring and comparing creative effectiveness."